Have I already mentioned that I love sweet potatoes? No? Well I freakin love me some sweet potatoes! I think my love of sweet potatoes happened accidentally and is a fairly new love for me. Of course it started with sweet potato fries, duh. Who doesn't love those crispy little fries from heaven? Then I started making them on my own, or at least trying. Then, I chopped some up one morning, sautéed them, added eggs on top with a little melted cheese and BAM, sweet potato heaven! Seriously, though, I love how versatile sweet potatoes are and how much nutrition they pack in. 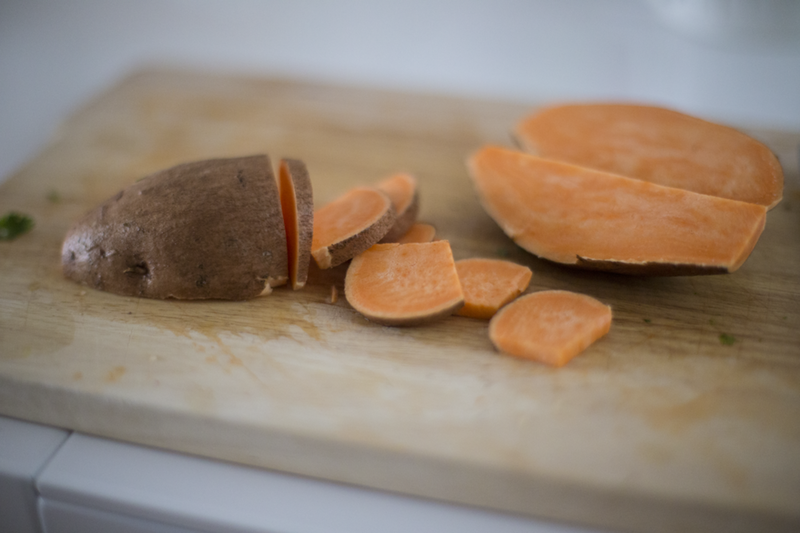 Sweet potatoes are an excellent source of Beta Carotene, vitamin C and potassium and they are high in antioxidants. They also contain vitamins B5, B6, and E as well as manganese and fiber. Yes they contain natural sugars but that's what makes them so yummy =) And, did I mention that they are pretty easy to prepare? I've gone through a few phases with my sweet potatoes. Roasting, sautéing, spiralizing, mashing and baking. I really love them all ways. My current go-to is a microwave baked sweet potato. It is just way too easy not to do! When done it looks like this →. To make, wash and poke holes in skin with knife. Bake in microwave for 4-5 minutes or longer depending on size of potato. Slice potato in half both ways and let sit for a minute to cool. Scooping the potato out of the skin makes it a little easier to eat but not necessary. Top with over-medium (or however you like them) eggs and any other breakfast item you like such as sausage, peppers and onions, cheese, avocado, etc. This is my favorite breakfast as you will see on my instastories. Eat with left-over grilled or baked chicken for lunch. Add a little butter to the sweet potato for some extra ♥. Stuff with chili. he sweetness of the potato is so good with the spice and acid of the chili. Call me crazy but I think it's better than cornbread. Gasp! Stuff with all the taco stuff. Ground meat, beans, lettuce, veggies, salsa, avocado or guac, sour cream, cilantro, etc. Ditto to what I mentioned with the chili. So. Good! Thai peanut chicken and sweet potato noodles. This is really good with the sweet potatoes and broccoli. You can sub any kind of nut butter for the peanut butter if needed. Ground turkey sweet potato skillet. This is one of Dan's favorite meals. It is so simple but really, really good. Feel free to add more veggies or use whatever color peppers you have on hand. I like to use a mix of Italian cheese for some extra flavor. If you are saying there is no way you are trying any of these because sweet potatoes are eww. Just try it and thank me later. There are so many great ways to eat sweet potatoes. They are easy, healthy, cheap and so yummy! What are your favorites?